OMG, I forgot to show you the best part of Flea Market Thursday! I featured it on Facebook and Instagram, but the photos weren't in my "to be blogged" folder, so they got left out of the post here. My favorite part is the the "Royal" logo; pushing it triggers the lid to pop open. I haven't extensively researched it yet, but I believe it to be a "Royal Quiet Deluxe", manufactured in six colors (and gray) from 1955 to 1957. The first generation was produced from 1939 until 1948, and was the typewriter of choice for Ernest Hemingway. Later, Royal produced a special edition with gold plated accents which was famously used by Ian Fleming to write Casino Royale. Here is mine, cleaned up and ready to party. There is one listed on Etsy in pristine condition for over $500 -- I think I got a good score! Last Thursday was one of the nicer days of the year, and luckily for me coincided with the flea market. I haven't been listing (or even relisting) in my Etsy Christmas shop yet, but this box of Putz houses will be ready come July. They have been steady sellers for me in the past, and my inventory was depleted last holiday season. I could barely contain my excitement when I saw this giant antique scalloped ironstone bowl; it's almost a foot across in diameter. It has some chips and staining, but that only adds to the vintage charm, right? I also found a dozen of these ironstone bone dishes and they and the bowl have already been listed on Etsy and The Mustard Seed Pages. I'm on the fence about this little Elgin clock though. It may find a home here. Scary elf Adorable bunny rabbit pixie, sweet porcelain head angel tree topper with gold mesh dress, pretty flow blue transferware cup, and cute wind-up tail (Japan) doggie. On to the paper ephemera -- two big stacks of vintage ice cream sundae display pieces. I haven't counted them but it's a big 'ole stack. Anybody have an old fashioned ice cream shoppe? Or want to play Bingo? These animals are made of thick fiberboard and include stands.I wonder if I should list them individually or as a lot. What do you think -- worth the trouble? Of course it is! Happy Easter! I attempted to do a Flea Market Thursday last week, since the temperatures had climbed to the mid-50s, and a dealer friend was planning on selling. I may have been entirely too optimistic. Sadly, all I got was this small ironstone creamer, but at least I didn't slip on the ice. But then, on Saturday, we headed back to the Spring Garden Flea Market, which, fortunately, is held indoors. I was really looking forward to it since we had gotten some good stuff last time, and it had been cancelled the previous week due to another snowstorm. Anyway, we got lots of treasures, and Jill from Vintageology caught us in the act! Yes, that's another yard long photo under Mr. VJIMT's arm. I will have to try to get a decent photot of the collection in our upstairs hallway. I don't know how this one is going to fit -- it's as long as our small loveseat! The best part is that most of this -- everything except the large platter, paper ephemera, and enamel pot -- was from one guy, who really just wanted it GONE! I may have gotten a few items to sell on the Mustard Seed Pages (although I've already claimed the blue transferware bowl for my work table). I went back three times, because he was still pulling out bins of stuff! You had to do some digging, but that's half the fun! The Valentines and sports cards are from a church flea later that morning. And because this was a make-up date, the regularly scheduled show is THIS Saturday! Woo hoo! I really thought last month's Flea Market Thursday would be the final excursion of the year. However, a balmy 60 degree December day quickly changed my plans! This was my first purchase -- a big box of rusty skeleton keys. 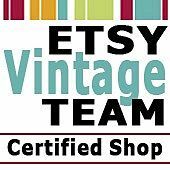 Two vintage boxes of crochet cotton spools (already listed). A box of plastic Christmas ornaments (again, listed). This egg shaped one with miniature reindeer and bottle brush tree has found a spot on my (not vintage) small tinsel tree. A bunch of Putz houses -- this set was made in Czechoslovakia, and there were a few others from Japan (listed, and sold!). Gold foil wing angel, made in Japan. I've already sold one this season just like her in my Etsy Christmas shop (update -- she just sold too!). Big suitcase. I like the metal name plate. … and the Papoose. I really like them both. I may be a collecting clocks after my scores in Bouckville this summer. And the final (scary) piece -- this baby doll head with rolling eyes. Really creepy! Mr. VJIMT is keeping her. It's supposed to be close to 70 degrees on Sunday -- another good day to go to the flea market. So what if I still have a tree to decorate, Christmas cards to design and print, holiday shopping and wrapping unfinished, baking and cleaning to do, and guests coming later that day? There may be good stuff! Well, the last month has certainly flown by! I feel like I've neglected to keep you updated here; I've said it before, but I'm much better at posting a quick image to my Facebook page as things happen. One of the last yard sales of the season netted us some good scores. Like this super sweet rusty turquoise blue scale, which I bought with the intent to sell. Until I came to my senses, and put it on my desk, where it is staying. I bought this whole bag of Christmas atrocities because I could see those demonic adorable elves through the plastic. They were item #61 in my Etsy Christmas Countdown listings. Mr. VJIMT and I were able to do a quick Flea Market Thursday trip together because the schools were closed. Lots of fun! My BFF and I managed to squeeze in a day of thrifting between work and kid activities. The St. Dymphna statue sold as soon as I posted this image to my Facebook page. I made a pedestal plate out of the Johnson Brothers Christmas dish and that went too. The blue atomic ashtray was listing #331 of The Etsy 365 Project and sold this morning -- cha-ching! and this giant Mary statue (I left the baseboard dust there to keep it real). I blogged about the load of elf/gnome blow molds I found at our school rummage sale, but you didn't see the box I found them in. This is what I saw under one of the tables. I grabbed it and bought the whole thing for double what the church lady wanted without even looking at what was inside. This is what it looked like when I got them home -- even Luna likes them! Only two (one Santa and one snowman) were cracked. Five out of the six elves (gnomes?) have sold -- who wants the last one? Technically, no junking for me since I never left my booth, but the week of October 13 started off with our second fall Clover Market. It was a gorgeous day, full of sunshine and shoppers. This pile of suitcases was about three times higher when I started the day. I didn't even realize I had brought TEN typewriters with me to sell. And that isn't even my whole stash! I may need to start a museum. Or a self-help group. This little beauty on top went first. Scales were also a big seller. The orange was the third to go, along with a rusty green one and this turquoise one. This New Jersey flea, farmer's market, and yes, rodeo, is a recent haunt for me. As you can see, I did well in the vintage Christmas department. I am completely enamored with the soft, velvety, sequined tree skirt. I may have to keep it. I've gotten some pretty kitschy things in the past at this flea market, but this one has got to take the prize. The glittery, tinseled, flocked prize. Styrofoam glass-glittered cones full of fuzzy santas, plastic reindeer, frosted pinecones, chenille candy canes, sparkly tinsel, and spun cotton elves. It is truly a marvel. Or a disaster. I can't decide which. But I know someone is going to pounce on this kitschy dream/nightmare come true. So it's listed. I did find some less kitschy treasures, like this bunch of scraggly bottle brush trees and a cool frame in which to make a chalkboard. Still more Christmas, and some religious. This sale is held only once every two years, so it has been eagerly anticipated. Large rooms full with well-organized (and priced) vintage Christmas and Pyrex. I came out a little woozy and smelling of moth balls. The week ended with some rescheduled town-wide yard sales. Here's the first load; we had to stop back home to make room! And the rest of our finds. Pickle jars, new old stock wedding cake toppers, and a giant ironstone platter among them. So I wasn't kidding, was I? Best. Junking Week. Ever. And it may well have been the end of the shopping season here on the chilly East Coast, so at least I went out with a bang! A Flea Market, a Church Rummage, and a Town-Wide. Discuss. Last week was a fun one in junking land; a flea market, a church rummage sale, and a lots of yard sales on the weekend. Here are the Flea Market Thursday finds. 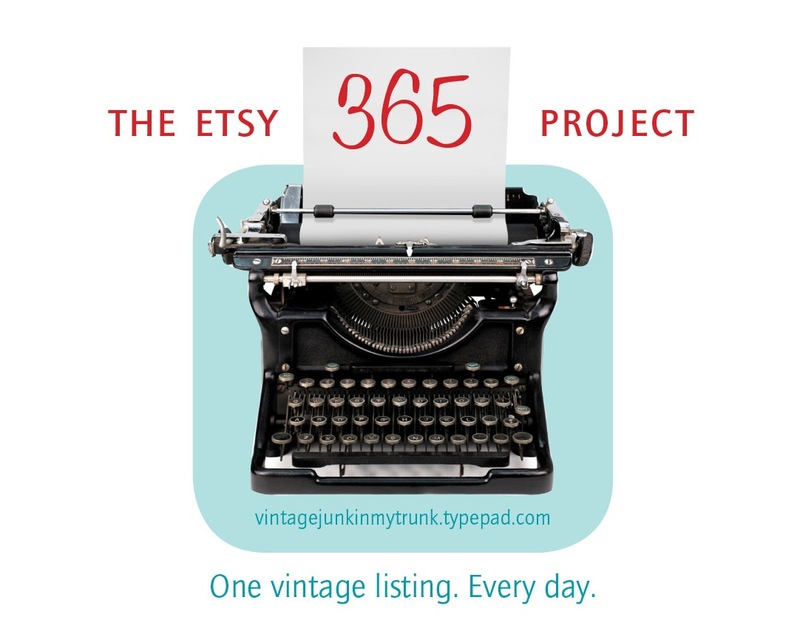 The vintage Christmas will all be listed in my Etsy 365 Project. The Pyrex is for me, and the photo and camera are for Mr. VJIMT. A church rummage sale started that same night at 6pm. They gave out numbers at 5pm, which I didn't know about. All that number did was get you down the stairs 10 seconds before the rest of the crowd, although I guess every little bit helps! I got this at the rummage sale; I thought Mr. VJIMT could make something out of this old window frame. He likes when I give him projects. A church rummage sale staple -- vintage Christmas tablecloths. They have some issues, but I couldn't pass them up. Saturday featured a local town-wide sale, a (different) church yard sale, and a few other stray ones thrown in for good measure. We got lots of good stuff, although our buying was interrupted with kid dropoffs and pick ups throughout the morning. But you know it's going to be a good day when this is your very first score! I'm not sure what I liked more, the cat snoozing in the sun or the desk. Sadly, neither came home with me. What we did get: a big set of flash cards, vintage tins, an aqua coffee pot, blue Christmas ornaments, a mid century condiment carrier, a miniature silver Christmas tree, and a fine piece of religious foil folk art. All heading to Etsy! And… a slate chalkboard, an red easel chalkboard (took the legs off to get it into the car), a wood shelf (another project), and a tin ceiling mirrior. And look at this GIANT bench for ten bucks! But wait, I'm not done yet! A flower painting, two toolboxes (perfect for holiday decorating), and giant spoon (font?) thing, some flower frogs, a camera, a book on raising dogs, and an aqua jeep. I told you it was a fun couple of junking days -- hope the rest of the month is more of the same!